When you have new carpet installed in your home, carpet care is your most important tool you can use to extend the life of the material. No matter how good your carpet installation may be, without proper carpet care, it will not last very long. That is why it is so important to learn how to treat your carpeting correctly. Caring for your carpeting will also protect your warranty. Damage that happens from improper care is not the fault of the manufacturer or the retailer and can result in voiding your carpet warranty. 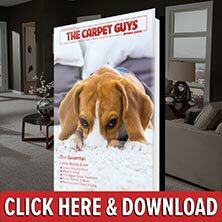 Make sure to see what kind of carpet care the manufacturer recommends. If any damage comes from cleaning that they do not recommend, it will result in voiding the warranty. Warranties that cover wear, texture, and stains are only between manufacturers and customers unless your retailer specifies otherwise. Any kind of item that is purchased from a clearance sale or a special closeout is purchased in the condition shown. Unless there is a warranty given on these items by the retailer, there will not be one included. If your carpet begins to crush, shed, fluff, or snag, understand that this is a common quality of any carpeting. This is common with all types of carpeting, so they are not considered as manufacturing defects. Once you have familiarized yourself with these different aspects, carpet maintenance is an easy process. Maintaining carpet properly is pretty self explanatory, and as long as you know what the manufacturer recommends, you can avoid voiding your warranty. The easiest way to maintain your carpet is vacuuming. This is the most effective way to care for your carpeting, yet it is typically overlooked. Carpet is good at collecting dust and left over dirt from foot traffic and pets. Vacuuming will get rid of it and protect the softness and comfort of the carpeting. Occasionally moving furniture around a room can enhance the look of the carpeting as well. It seems like a weird carpet care technique, but it works. It simply gives carpet somewhat of a “younger” look. The biggest way to properly maintain carpeting is to have professional carpet cleaning done. It is recommended that it should happen every twelve to eighteen months. Carpet cleaners can get all of the junk that is deep in the carpet that vacuuming cannot. Plus they can restore almost all of the life back into the material. Normal carpet care cannot exactly do this. The importance of carpet maintenance is evident. To prevent your carpeting from losing it's life to quickly, make sure to properly care for it routinely.